My weekends are always pritty much the same - crammed with rugby games, chores, family visits, oh, and more rugby. A couple of weeks ago though, those two boys of mine stepped up their rugbying game a little bit more than normal (if that's even possible) and off they went, for a full two-days-one-night trip away alongside a coach full of "Lads and Dads", meaning it was just myself and the little lady at home. Well our routine was pritty much the same as any day really - be it a weekday, a weekend, a holiday or not - nothing has too much scope for difference when there are small, routine-loving kiddies about - especially when it comes to the mornings...oooh those mornings are always so, so early. But I'm used to it now and an everyday 5.30 am wake-up call is very much the norm for me, but I'll admit, sometimes - just sometimes - I will have a little think about how amazing the sheer indulgence of a longer lie-in would be. Which automatically makes me think of that ultimate one day of the year when it is almost the law that Mums have a little bit of R&R time - Mother's Day of course. There can be no more of a perfect time to be playing the "I deserve some pampering" card in my opinion. And what does every good Mother's Day have to begin with? 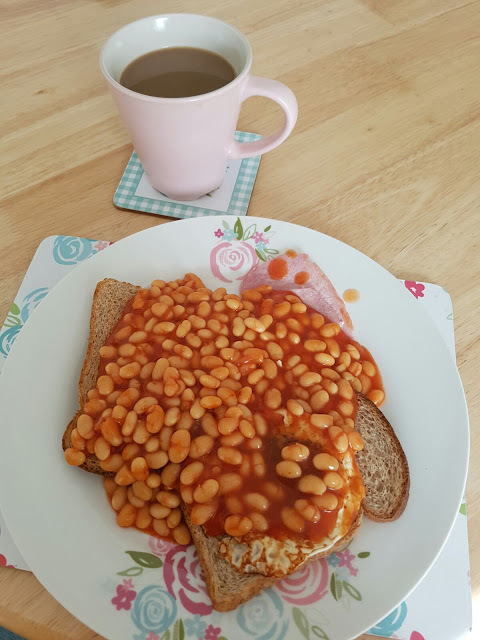 Yes you guessed it - a really good breakfast...served in bed if you're very lucky. Hmmm...relaxing in bed and eating yummy food - it doesn't get much better than that surely. I mean what breakfast is complete without a huge mug full of this amazing stuff right. It's only right to enjoy every meal in courses isn't it? I think so anyway and for 'starters' I love a little bit of yummy fresh fruit topped off with yogurt. 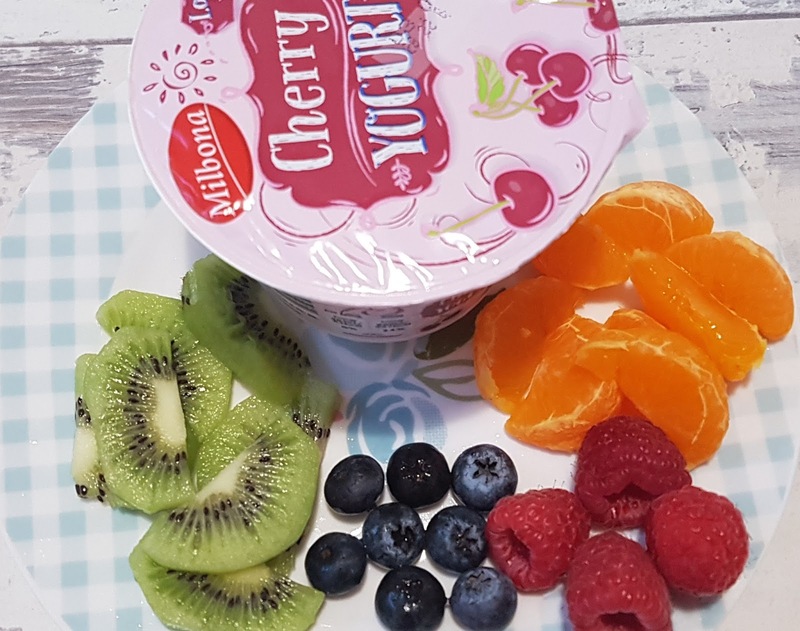 It is very Slimming World friendly and is very tasty too - I've also managed to get it down to a one-pan meal - less washing up, and lets face it, you have to be fast if you want to eat a meal hot with a toddler around. Bacon and "fried" egg on toast with beans and a side of mushrooms. I usually "fry" the mushrooms in the pan alongside the bacon whilst the toast is popped into the toaster, once these are cooked in goes the egg, giving it a little flip to cook the top - but carefully, we don't want un-runny yolk - then, once that's all ready on the plate, throw some beans into the pan, and job done. And even better, on Mother's Day (or most weekends actually) the Hubby will make it for me - so no cooking either. I reckon that after tucking into this lovely lot I'll be very well set for any Mother's Day activities that may be thrown my way. Do you have an amazing way to start Mother's Day off perfectly? My breakfast efforts dont usualyl extend further than a bowl of cereal!